Since the start of the 2011-12 school year, donning my different hats, I have had the opportunity to visit some of the highest performing and some of the most challenged educational environments in Los Angeles County. As a consultant to charter schools, I witness children from low-income, gang-ridden communities getting an outstanding education and the opportunity to move beyond the low expectations and doomed futures of their less fortunate peers. As a member of the LA County Board of Education, I see youngsters from the very same communities who have not had the same benefits. These children are in the juvenile court system schools. In some cases- in well-administered probation camps- they are getting the support that should have been there in the first place, and some are even completing high school graduation requirements. Many, however, are not progressing and have an excellent chance of returning to the camps and ending up in the adult prison system. Recently, David A., a student at Bright Star Secondary Charter Academy near South LA, shared his poignant personal experience with members of his school community. Better than anything I can report, his story illustrates this stark dichotomy in educational and social outcomes. 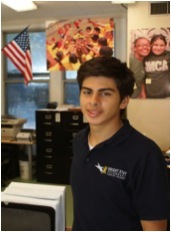 My name is David A., and I am a senior at Bright Star Secondary Charter Academy.